Bay View, which occupies an elevated position above St Austell with far reaching views across Carlyon Bay, is a recently constructed, modern house that has been tastefully decorated and furnished. There is a small, fenced urban garden that also benefits from the vista with outside furniture. The kitchen is fitted with an induction hob and all necessary pans and the spacious main bedroom also enjoys the view. 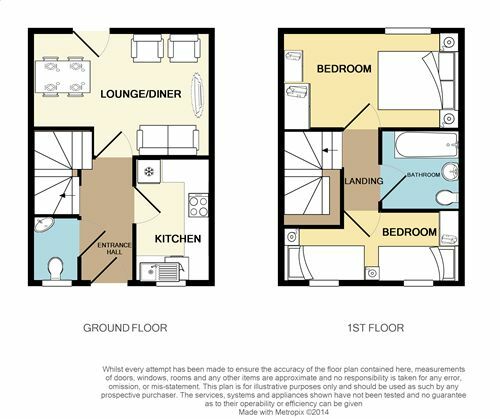 First Floor: Master double (with 4'6" bed) bedroom with far reaching views, twin bedroom and bathroom with shower over bath, wash hand basin and WC. External: Fully enclosed rear garden overlooking St Austell Bay. Dedicated parking space to the side of the property. Gas central heating. The kitchen has a range of fitted units, an electric oven and induction hob, washing machine and a combined fridge / freezer. The sitting room has a TV with digital Freeview and a DVD player. There is mobile 3G coverage. Electricity, heating, bed linen & towels are all included, but you will need to provide your own beach towels. There is a dedicated parking space available at the property. We regret no smoking is permitted within the property. Up to 2 well behaved dogs may stay at Bay View for a small additional charge of £25 per dog per week. A stair gate is provided. Once a market town St Austell is the central location for visiting the South East of Cornwall. With large attractions such as the Eden Project on the outskirts of St Austell, The Lost Gardens of Heligan a 15 minute drive towards Mevagissey, and Charlestown mere minutes away it provides an ideal base for your travels. The coastal town of Fowey is a simple 20 minute drive past the China Clay port of Par, offering fabulous restaurants, galleries and gift shops. A short car ferry across the river takes you on to Polruan. Daphne du Maurier spent her later years in properties in and around Fowey, a festival of her works takes place each May. St Austell was once the major producer of the world's China Clay, now with cheaper foreign imports the industry is in decline but The Wheal Martyn China Clay Museum set in two former working pits depicts the countryside in years gone by. Wet weather activities could include the visitor centre at St Austell Brewery, sampling beers and ales made on the premises. The brewery has recently started exporting their products across the Tamar River to England, so you may just find where your favourite brew is made. To the North it is only a 20 minute drive to Newquay, These days Newquay's excellent surfing waters are the town's main industry, where as it once used to be a major export port for counties mining efforts as well as a north coast port for pilchard fisheries. Fistral Beach holds many surfing competitions throughout the year, and also hosts Run to the Sun over May Bank holiday, a VW and Custom Car Show. Both the Women's and Men's Gig Championships are held here, as a balloon festival and surf and lifesaving events. Newquay Zoo now houses 130 different species in sub tropical gardens in the centre of the town. We were pleasantly surprised by the Welcome we received from the owners Rob and Mat. Made us feel at home. They supplied a few essential Goodies like Coffee and Tea.Milk and even a bottle of of Wine. . The accommodation was clean Comfy and had everything we needed.We had a Lovely view of Gribben Head and the Coastline.from the back of the house. The Cottage is near a big Tesco's Asda and Lidl. So convenient for food shopping.We were near The Eden Project and Lost Gardens of Heligan. Charlestown is nearby and very pretty We would highly recommend Bay View as a good place to stay. Guest from Weymouth stayed for 7 nights. On arrival greeted by a black dustbin, half full of water and a dirty nappy on the doorstep! Cleanliness of the property left a lot to be desired. Dishes, oven tray had to be washed before we could use them, air vent in bathroom covered in dust & did not work, dead spider and screwed up receipts on floor behind bin in the bedroom. The views were stunning! Dissapointed at the lack of information, other than a stack of leaflets, on the surrounding area, walks, beaches, etc. Fortunately we were both fit so the walk into and back from St Austell did not cause us problems, but it could for someone with mobility issues, a fact omitted from cottage information when booking. Interesting reading through previous occupants feedback. Several had made mention of the lack of wifi, another fact omitted in the cottage description and expected in this day and age. It caused us problems as we were not able to research places to visit. We would have been happy to pay for this. We got the impression that the feedback was never acted upon, in which case why bother having it in the first place. I did try to contact the owner to provide him with my comments as I did not wish to leave negative feedback without giving him the option for a response, Needless to say I have heard nothing. Bay View is a nicely laid out property with a sweet tiered little garden. The owner is very responsive to any queries. Small but very functional kitchen, comfortable beds and tasteful decor throughout. The actual area where Bay View is in St Austell is not great as within a few minutes walking distance there are no decent pubs or restaurants. Very good base though to explore Cornwall. We really enjoyed our stay. The location was a bit out of the way, and we lost our way a couple of times, but soon got the hang of it. The provision of a local map would be so helpful. We found Bay View was excellent for our purpose; we needed a break, and the area was quiet, the house comfortable, and the owner most helpful when we couldnt fathom the cooker! The mattresses need updating tho' .. a little on the thin side! All told, a good value holiday property. Guest from Sheffield stayed for 7 nights. The property was clean and well furnished. Parking could be a problem, whilst we had no problems it was extremely tight. The property offered good value for money. Guest from Oadby stayed for 7 nights. Guest from Llangollen stayed for 7 nights. The house was in a good location but people with walking difficulties would have problems. No internet connection. The cooking dishes needed washing before use as they were greasy. The cooker was difficult to operate. The Parking is limited in space and difficult to access. But in spite of this the house is in a good location for exploring Cornwall and as we had good weather we did not spend much time in the house. Never did find the DVD player though there was some disks there. Clean and modern house. Fresh, modern decor. Very helpful and friendly lady at number 24. Parking is a nightmare. The allocated space is tight, especially if neighbours have parked in front of their garages. Anyone with a large car or two cars would struggle.Parking outside the house is virtually impossible as neighbours either side park in such a way that there isn't quite enough room! Beds are uncomfortable. The single beds squeaked every time you turned over and you could feel the springs. The dining area is lovely & fresh but the sofa & chairs are not comfy. Nice outdoor dining area if weather permits. The TV was a bizarre & turned itself on during the night. A bit more info would be useful - how to use induction hob, day of rubbish collection etc. The bathroom is nicely decorated and family friendly but beware the shower mat - it's slippery. Would have liked larger towels - if you like a bath size towel - take your own. The view of St Austell Bay is great. The house is in a good location for central Cornwall. As former St Austell residents we were only here to visit family so not really doing the tourist bits. Would we stay here again? I don't think so - just the parking issue is enough to put us off. Guest from Crickhowell stayed for 7 nights. Very nice cottage within good distances from lots of holiday locations including Eden Project. Very peaceful, good neighbours and parking. Weather was wet and damp so could have done with some indoor drying facilities as it was difficult to dry laundry - just a small drying rack would sufficed. We did not understand how to use the cooker hob and eventually contacted the owner who very kindly helped us out. Maybe some advice could be left for future people who, like me, are no always familiar with these devices. Guest from Goole stayed for 7 nights. a nice place but a bit out of the way.cleanliness could have been better.wifi needs installing,beds were very comfortable.the bath was very slippy and the new bathmat that was in it needs changing,very dangerous. Guest from Walsall stayed for 7 nights. Spectacular views over the bay from the back of the property and the decking. The property and location provided a good base to see a lot of Cornwall. The Property is dog friendly and we were amazed at the number of places in Cornwall that we could visit with our dog too. The property's fridge had a fault while we were there, the owner was easy to contact and dealt with the problem straight away. We really enjoyed our stay. Had a good stay here. Pros: comfortable accommodation, nicely furnished, clean and well maintained. Good town location for exploring mid Cornwall. Cons: no house instructions to explain things like how the rubbish collection works. The tv appears to only have channel 45 & 80 and switches itself on in the middle of the night! The bottom stair is dangerous and we both tripped down it more than once. Parking is a total nightmare - allocated space is tricky to get in and out of but road is congested. That said, I think the owner has done a nice job on it as a rental property, just a couple of things need looking at to improve. a good base for visiting all the places we love in Cornwall. Modern clean and tidy with a nice area to sit out. Great views. Parking was the only really issue as the street is very compacted and with a family car as we have, the designated parking space was in an awkward position to get in to. Guest from Hove stayed for 7 nights. It mentioned 10 minutes from shops and pubs, this should be clarified as 10 minutes drive to the shops and pubs ! Although there was a Tesco's express at bottom of hill few minutes walk away. The allocated parking down side of property it very difficult to access in and out, as other people parking in that area leave cars outside of their garages and therefore very restricted movement. Lovely views over St. Austell Bay. As we were two Ladies staying in property we used the two rooms. I would suggest the single bedded room is only suitable for children as bed was very uncomfortable. It would have been nice to have a long mirror somewhere for dressing. Door mat would have been useful to wipe feet when in and out. Very accessible for visiting Eden Project and other areas in Cornwall.